the Contract Pack, I would often find myself forgetting to include items in my agreements with clients that lead to frustration, usually on my part. This contract pack has allowed me to keep a consistent look to my client documents, and helped me be more proactive and helpful to my clients, by covering all of the bases I need to cover." This Exhibit F (Project Change Form) is included in editable Word format that can be customized in Word or by using the included Wizard software. How do you write a Exhibit F (Project Change Form) document? Financial Impact and Schedule Impact. 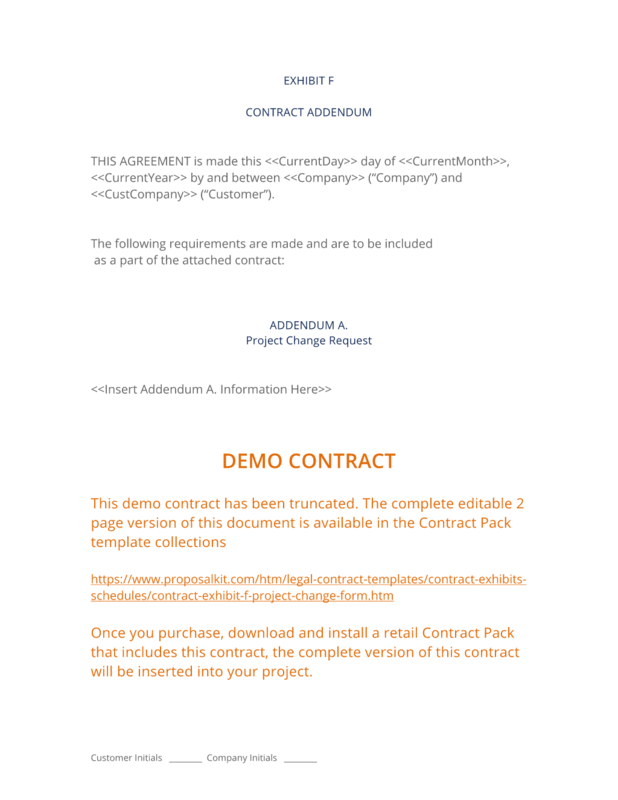 The complete Exhibit F (Project Change Form) - with the actual formatting and layout - is available in this Contract Pack.